Всем привет! My name is Marianne and I am the new summer intern at the Russian Language Academy Durbe. I come from France but I study in the UK. On my first day as an intern, I took part in a walking tour offered to all the students of the Academy for them to discover Riga. 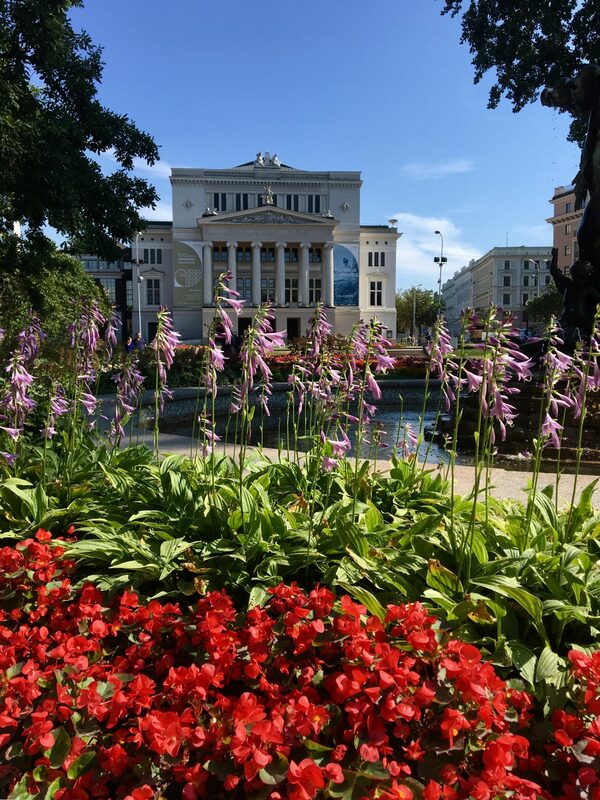 If you want to find out about the most ancient part of the capital of Latvia and do not fear heat, follow our guide, Natasha! She will tell you not only about the forgotten legends of the Old City but also will show you where to find traditional specialties in hidden underground cafes. 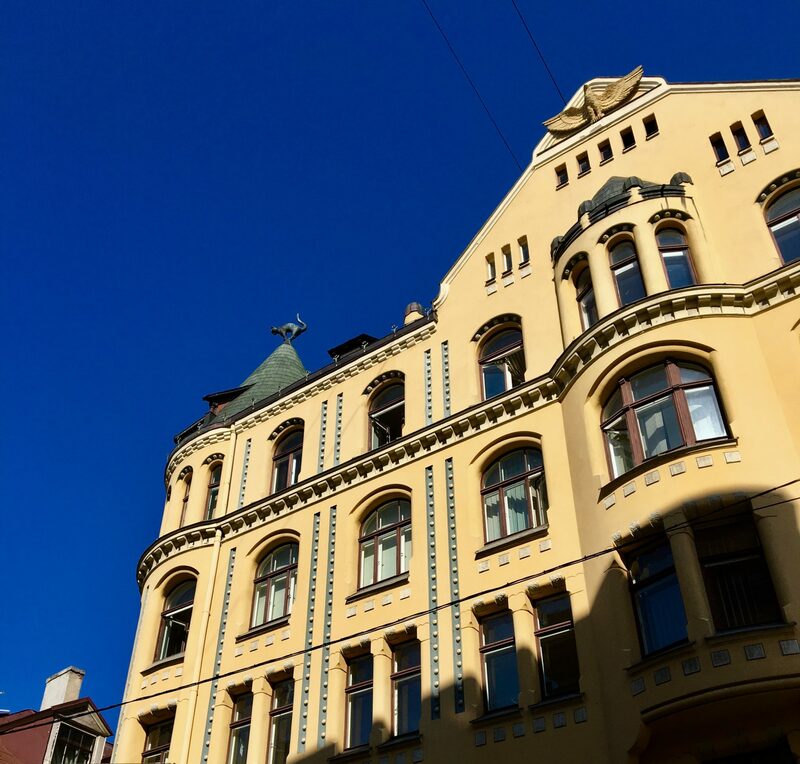 I found it particularly enjoyable that, from the Academy, you are only a few minutes’ walk to some of the most interesting and impressive monuments of Riga. 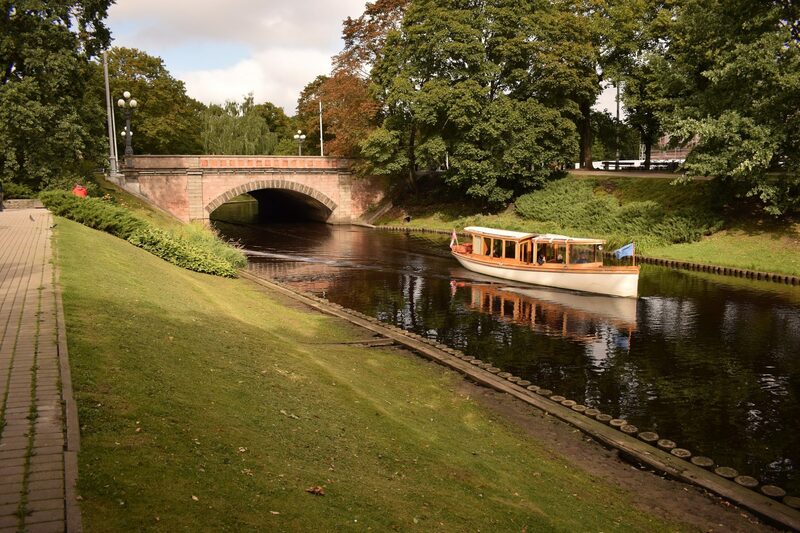 As we started our tour walking along the canal, the Old Riga already revealed itself as a mysterious place, whose monuments are highly symbolically and historically charged. 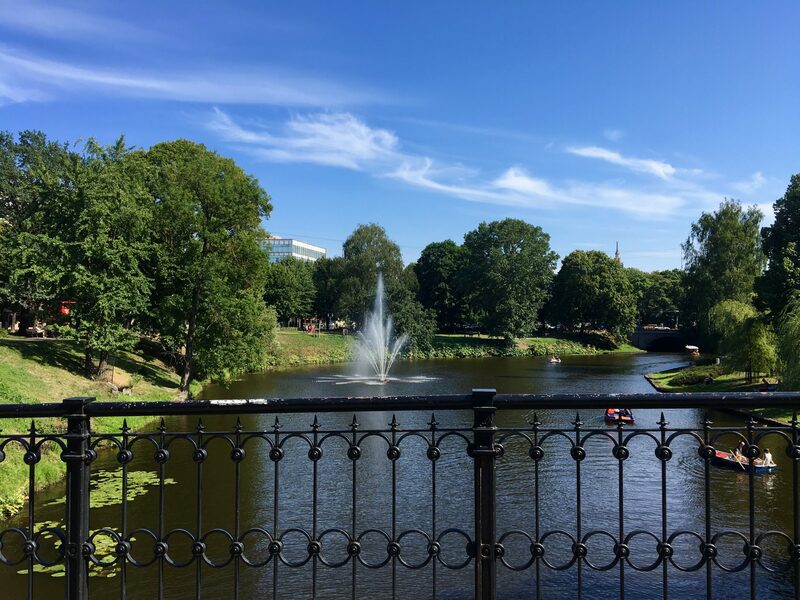 I was struck by the colours of the Old town: Riga, despite being far North, displays at times warm monochromes of yellow and orange and, strikingly, appears to be a very green city with an impressive amount of parks. It is also very common to encounter street performers whose music fills the air of the Vecriga. As we walked along the narrow streets of the Old town, we were relentlessly chatting with our guide (in Russian, please!) and pressing her with questions about Riga’s tormented history, bad Russian omens, and Balsam, a traditional Latvian drink that is renowned for its medicinal value. Natasha is extremely knowledgeable about the city and she managed to offer us highly cultural content in a friendly and relaxed atmosphere. I must add that I was slightly moved by the legend surrounding the Swedish Gate, a part of the Old Town’s walls that used to be the access point to the city in the Middle Ages. The legend says that a young woman was immured in the gate as a punishment for loving a Swedish soldier and that, sometimes, you can still hear her whispering at night: „и все таки я тебя люблю” („and nevertheless, I love you”). Luckily I was wearing sunglasses and no one saw me shedding a tear! Feel like joining? The Academy organizes free tours every Monday, so come along to deepen your knowledge of Latvia and to keep practicing Russian outside of classrooms!